About one-third of the earth's landmass is desert or semi-desert. These regions have unique geologic features not found in more humid environments. These features are most often caused by wind and water erosion in the stark desert environment. Deserts are usually created because they are located in a rain shadow -- a dry region downwind of mountain ranges caused by air losing its moisture as it passes over mountains. Desert areas usually have internal drainage -- when streams drain toward landlocked basins rather than flowing eventually to the sea. When the water from these basins dry it is called a playa. Because of the factors above, deserts often have less vegetation to prevent erosion, which in turn leads to further barrenness through deflation -- the removal of silt and sand particles from the land surface by wind. 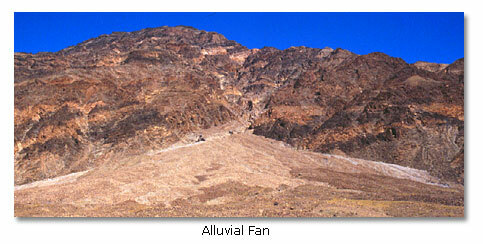 Alluvial Fan: A large, fan-shaped pile of sediment forming at the base of narrow canyons onto a flat plain at the foot of a mountain range. Alluvium: Unconsolidated gravel, sand, silt and clay deposited by streams. Anticline: An arched fold, usually in the shape of an inverted U.
Arroyo: A dry desert gully. Bajada: A broad, sloping depositional deposit caused by the coalescing of alluvial fans. Blowout: A depression in the land surface caused by wind erosion. Butte: A narrow flat-topped hill of resistant rock with very steep sides. Probably formerly a mesa. Cenozoic Era: 0 to 65 million years ago includes the Quaternary and Tertiary Periods. Desert: Receiving less than 10 inches of precipitation annually. Desert Pavement: A thin, surface layer of closely packed pebbles. 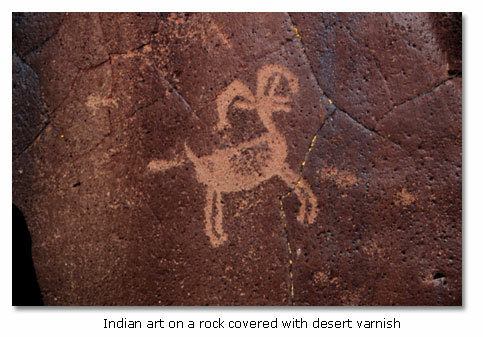 Desert Varnish: A hard, dark, shiny coating on rocks caused by chemical action. Detritus: Boulders, rocks, gravel, sand, soil that has eroded from mountains over time. Dunes: Mounds of loose sand grains shaped up by the wind. Hogback: An eroded, steeply tilted ridge of resistant rocks with equal slopes on the sides. 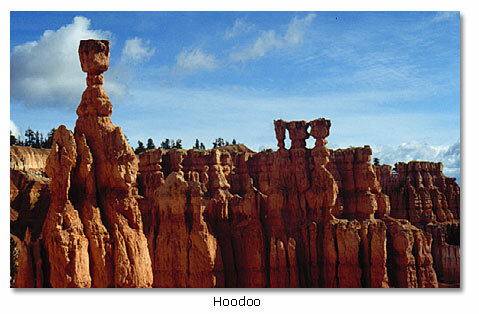 Hoodoo: A column or pillar of bizarre shape caused by differential erosion on rocks of different hardness. Jurassic Period: Age in which dinosaurs flourished, 144 to 288 million years ago. Loess: A deposit of windblown sand and clay weakly cemented by calcite. Mesa: Broad, flat-topped hill rounded by cliffs and capped with a resistant rock layer. Playa: A very flat, dry lake bed of hard, mud-cracked clay. Mesozoic Era: 66 to 245 million years ago, includes the Cretaceous, Jurassic and Triassic Periods. Monocline: An open, step-like fold in rock over a large area. Paleozoic Era: 245 to 570 million years ago. Pangea: The super continent that broke apart 200 million years ago to form the present continents. Pediment: A gently sloping surface, usually covered with gravel, the result of erosion. Plate Tectonics: The theory that the earth's surface is divided into a few large, thick plates that are continually moving. Precambrian Era: Prior to the Paleozoic Era, 570 millions years ago. Semiarid: Receiving between 10 and 20 inches of precipitation annually. Syncline: An arched fold in the shape of a U.
Triassic Period: 208 to 245 million years ago when large predatory reptiles (dinosaurs) evolved.